The objective of the "Mr Jack" player is to manage to escape the investigator before dawn or to leave the neighborhood taking advantage of the darkness. The objective of the player "the investigator" is to discover under which identity is hidden Mr. Jack and stop it before dawn. 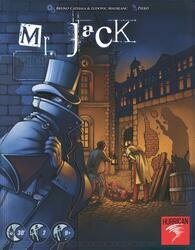 Mr Jack is an asymmetric game for two players. Each player has a different purpose. One player takes the role of the investigator the other one of Mr Jack. The investigator must find under what identity is hidden Mr Jack then catch him. Mr. Jack tries to take advantage of the darkness to leave the neighborhood and does his best to delay the investigation. By successive inferences, placing the characters in the shadows or in the light the investigator reduces the number of potential suspects and tightens the vise around Mr Jack. Will he be able to capture him before the eighth round?